Line a 9 x 13-inch baking pan with aluminum foil. Spray the foil lightly with nonstick cooking spray. In a large pot, combine the nut butter, brown sugar and honey. Bring the mixture to a boil over medium-high heat, stirring constantly. Lower the heat and simmer until the sugar dissolves and the mixture is slightly thickened, about 2 minutes. Remove the pan from the heat and stir in the vanilla and salt. 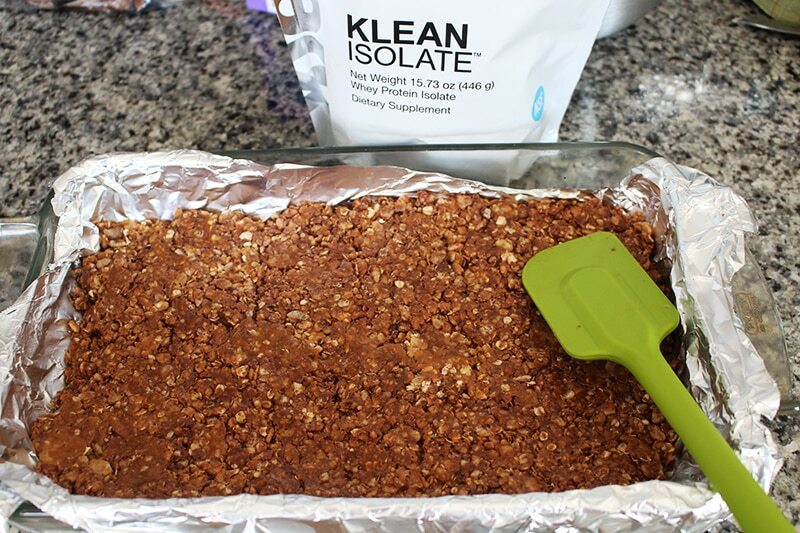 Add the oats, rice cereal, Klean Isolate™, flax meal (or wheat germ) and mini chocolate chips to the pan. Fold the dry ingredients into the wet ingredients with a rubber spatula until well combined. Transfer the mixture to the prepared pan and press down firmly with a rubber spatula to even out. The mixture should be tightly compacted in the pan. Place the pan in the refrigerator for 1 ½ to 2 hours to cool. Use the foil overhang to transfer the uncut bars to a cutting board. Using a sharp knife, cut into rectangles. Store the bars in an airtight container in the refrigerator. If you have to stack them, be sure to use parchment paper or foil in between the layers; otherwise, they’ll stick together and fall apart. Note: If you are substituting dried fruit for the chocolate chips, mix it in along with the other ingredients, as opposed to sprinkling over the top. 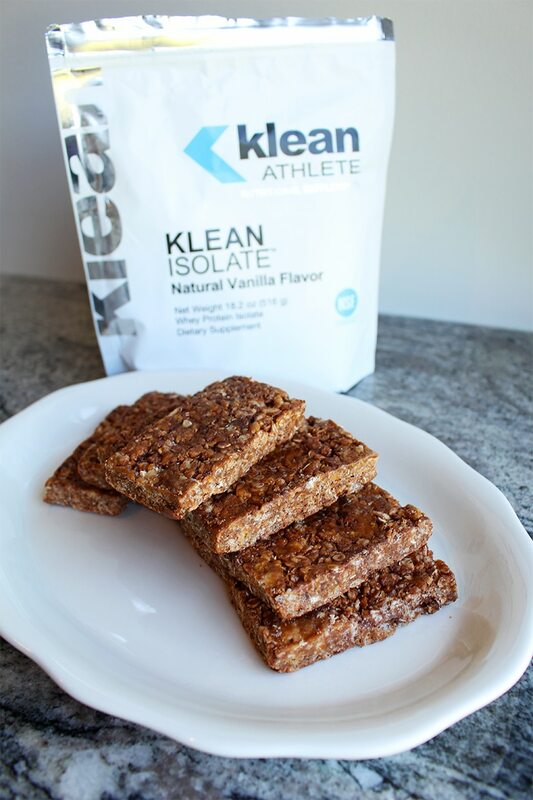 Nutrient Content per Granola Bar: Calories: 167; Carbohydrate: 24 grams; Fiber: 2 grams; Protein: 6 grams; Fat: 7 grams; Vitamin B6: 8% Daily Value; Vitamin B12: 8% DV; Folate: 12% DV; Thiamin: 12% DV; Iron: 11% DV; Zinc: 10%; Magnesium: 11% DV.